The Hollies are an English rock group known for their pioneering and distinctive three part vocal harmony style. 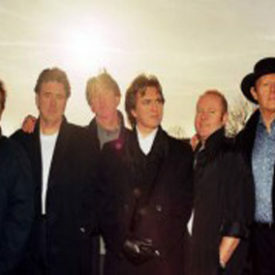 The Hollies became one of the leading British groups of the 1960s (231 weeks on the UK singles charts during the 1960s; the 9th highest of any artist of the decade) and into the mid 1970s. It was formed by Allan Clarke and Graham Nash in late 1962 as a Merseybeat type music group in Manchester, although some of the band members came from towns north of there. They enjoyed considerable popularity in many countries (at least 60 singles or EPs and 26 albums charting somewhere in the world spanning over five decades), although they did not achieve major US chart success until 1966 with “Bus Stop”. The Hollies had over 30 charting singles on the UK Singles Chart, and 22 on the Billboard Hot 100, with major hits on both sides of the Atlantic that included “Just One Look”, “Look Through Any Window”, “Bus Stop”, “I Can’t Let Go”, “On a Carousel”, “Stop Stop Stop”, “Carrie Anne”, “Jennifer Eccles”, and later “He Ain’t Heavy, He’s My Brother”, “Long Cool Woman in a Black Dress” and “The Air That I Breathe”. They are one of the few British pop groups of the early 1960s that have never officially broken up and continue to record and perform. 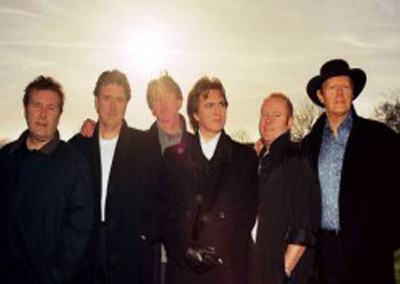 The Hollies charted at number 21 in the UK in 2003 with compilation album, Greatest Hits in CD format. The group released a studio album Then, Now, Always in late March 2009, again featuring Peter Howarth on lead vocals. The album was later given an official release by EMI in 2010 with the addition of an extra original song, “She’d Kill For Me”. In recognition of their achievements, the Hollies were inducted to the Rock and Roll Hall of Fame in 2010. In the same year, a compilation album, Midas Touch: The Very Best of The Hollies, charted in the UK at number 23. In 2012, the Hollies released Hollies Live Hits! We Got The Tunes!, a live Double CD featuring the Hollies’ live performances recorded during the band’s 2012 UK Tour. 2013, the Hollies 50th year, was packed with a world wide 50th Anniversary Concert Tour performing over 60 concerts. As of 2014, the Hollies still tour with two very early, if not original, members: guitarist Tony Hicks and drummer Bobby Elliott.